A modern interpretation of an early automaton singing bird. Manufactured using micro-mechanics, watchmaking skills and modern materials to overcome the minitiarisation of what were previously (made in the late 18th and early 19th centuries) larger and static based machines. The watch was developed over a three year period, the first prototype was finished in 2013 and the first watches launched into the market in 2014. 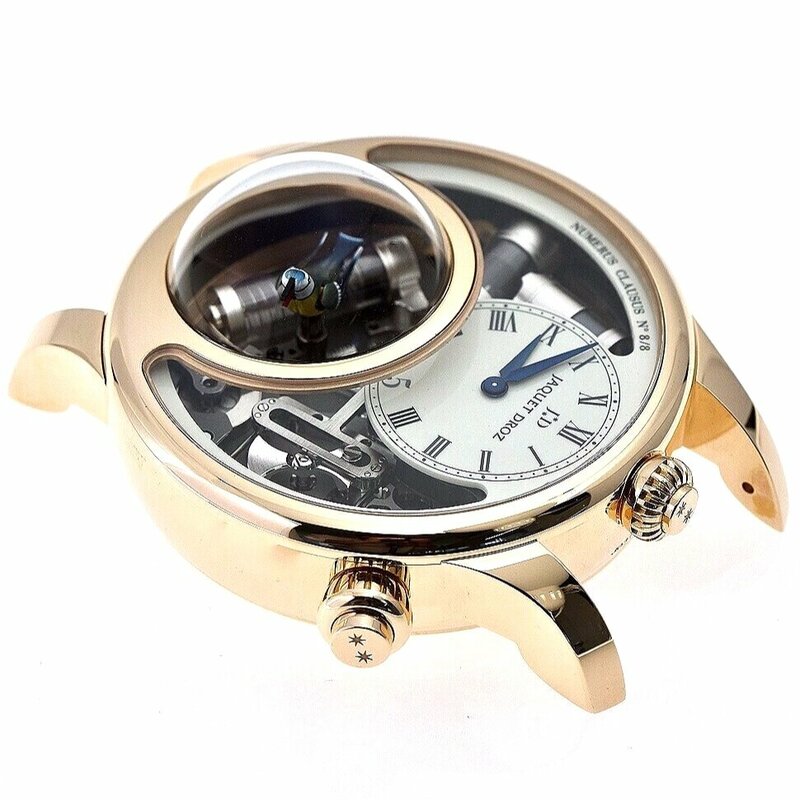 Hand-winding mechanical automaton movement with push-button activation, set at 2 o'clock on the side of the case. Diameter of case 47 mm. Watch caliber 29 jewels, automaton 15 jewels. The winding crown set at 12 o'clock is for adjusting the automatic calibre, (Jaquet Droz 6150) which sits below the dial and above the automatons barrel. Two different models of bird, the one on the left is made in 18k gold and hand engraved the one on the right (shown cased-up) is hand painted. 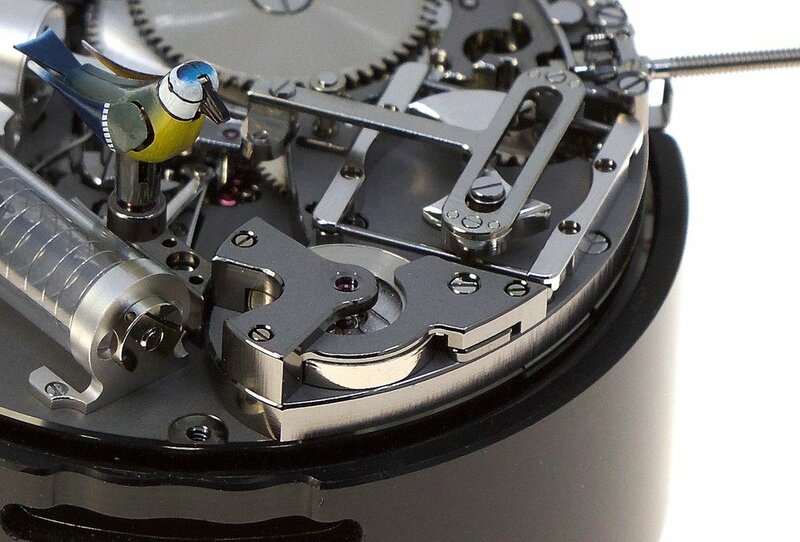 The pinion on the lower section of the bird assembly links to the rack which turns the birds body. 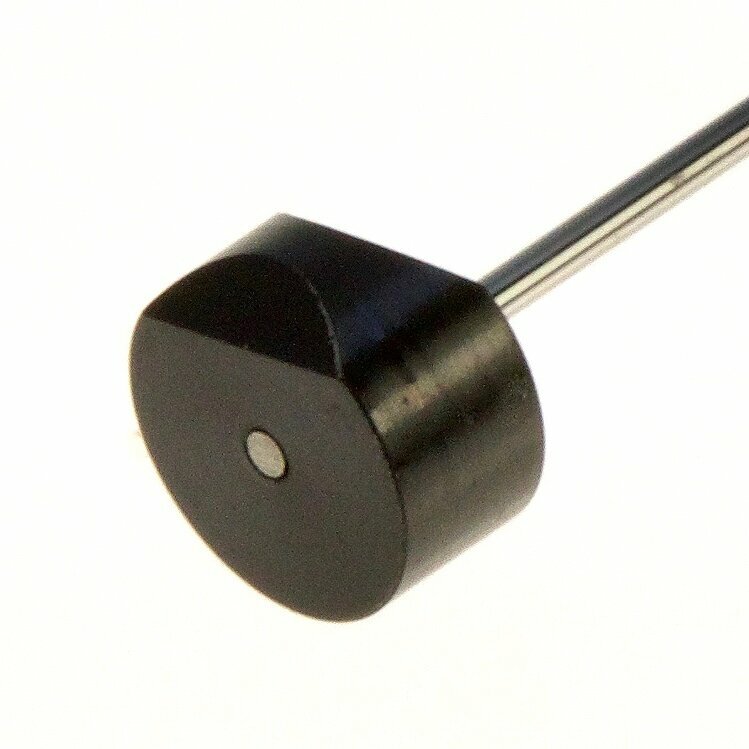 The steel rod below it is pushed vertically by an additional lever found in the movement under the rod. When the lever pushes the rod it causes the beak to open, as well as the wings and tail to move in-synch with the bird song. The sapphire case back showing the rear of the automaton mechanism. The plate with the hand engraved bird sandwiches in place a flat rubber seal insulating the canals along which the air travels between cylinders. The bezel removed with the sapphires in place. The bezel is held in place by 4 screwed plugs screwed from the rear of the watch, pulling down on the 4 threads (3 of which are visible below). The bezel removed showing the full dial. Numerus clausus ("closed number" in Latin) used here to define the limited edition of the model. The pistons pump the air, store it and produce the sound. The exact sound it makes is dependent on the speed of the piston and the size of the bellows opening inside the cylinder. The large upper piston stores the compressed air, the central piston is essentially the air pump generating the air, which is then passed from the upper storage piston to the lower piston which creates the birds whilstle. Each movement requires up to 6 weeks to be assembled by a watchmaker. There are only 4 watchmakers who presently have the knowledge and experience to assemble the entire product. The training process for a full qualified watchmaker to be able to assemble and adjust the product requires a minimum of 4 months. There are in excess of 262 components in the watch. Below is the piston assembly which receives the air from the top piston/cylinder and generates the bird song. The first image shows the graphite plug inside the tube and the curved lever which adjusts the position of the plug inside the cylinder altering the tone of the bird song produced. The speed at which the bird sings is governed by a magnetic and centrifugal braking system (developed by Breguet) shown below. The two sets of circular magnets which are adjusted by a screw/plug (the teeth can be seen on the flat disc to the left) to adjust the tension applied to the centrifugal brake which sits between them. The bridge covering the centrifugal brake system. Below, in the centre, the dismantled cam shaft, either side you have different views of the drive weight. Close up of the drive shaft system. The ratchet wheel, and part of the winding mechanism removed. 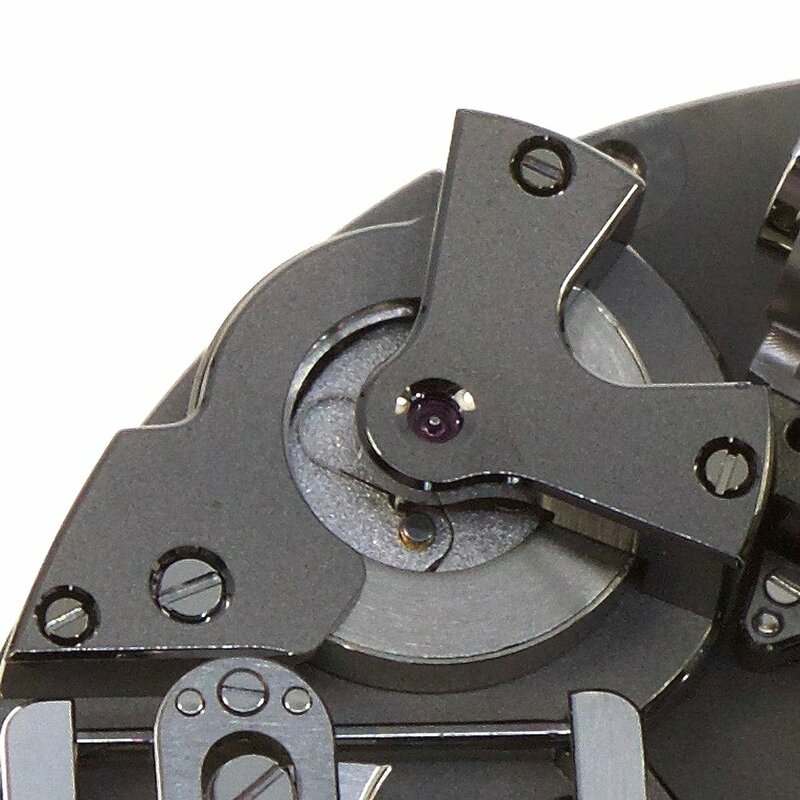 The black ring surrounding the movement is to support the mechanism whilst being assembled prior to being cased up. 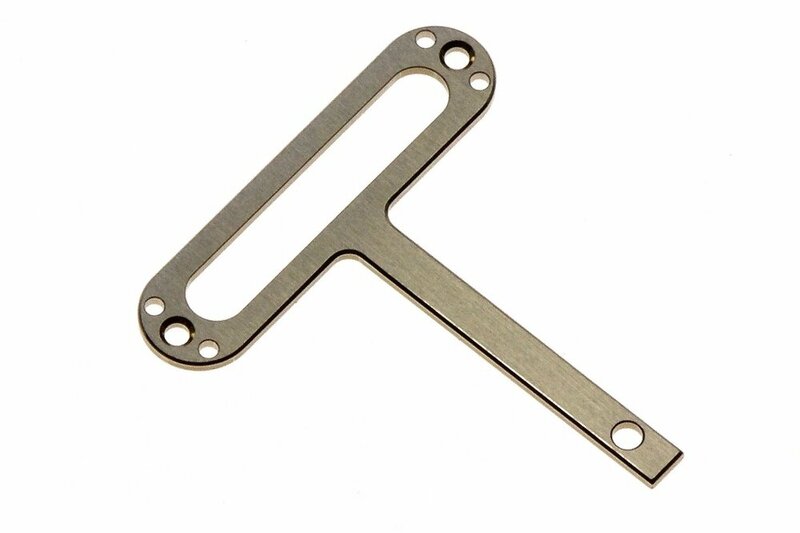 It is not a conventional movement holder but a precision made jig which allows the watchmaker to measure with specialised micrometers the vertical heights of elements of the mechanism whilst being assembled. When assembling the pistons the most time consuming element is the adjustment of the valve (hidden on the inside of the cyclinder, allowing air into the chamber but not out. The arms of this piece shown below (between the two discs), are reduced by hand by the watchmaker to under 2/100's mm. 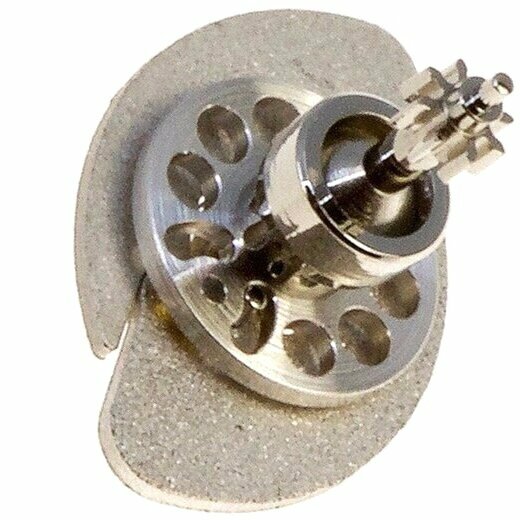 They must be of an exact tension to work effectively and the end section must sit perfectly flat against the disc to prevent air from escaping. Graphite is a crystalline allotrope of carbon, and a form of coal. Graphite is the most stable form of carbon. It is light, low in density and has a non-agressive impact when moving inside of the sapphire cylinders. 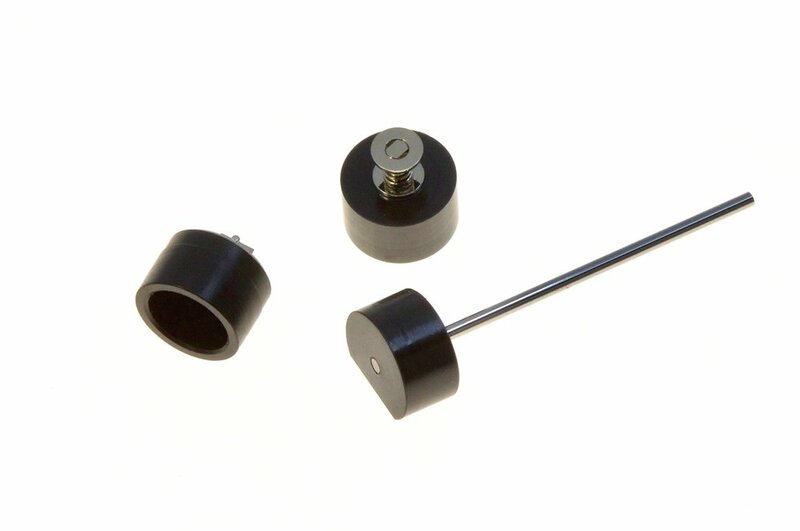 The piston rods are made form tungsten carbide to avoid any form of deformation which might occur due to changes in temperature. The cylinders are made from sapphire. The mainspring that is housed inside of the large barrel is the same design as that of an automatic movement, with a sliding bridal. Once fully wound the bridal slips around the inside of the barrel avoiding any likely hood of the mechanisms being damaged. 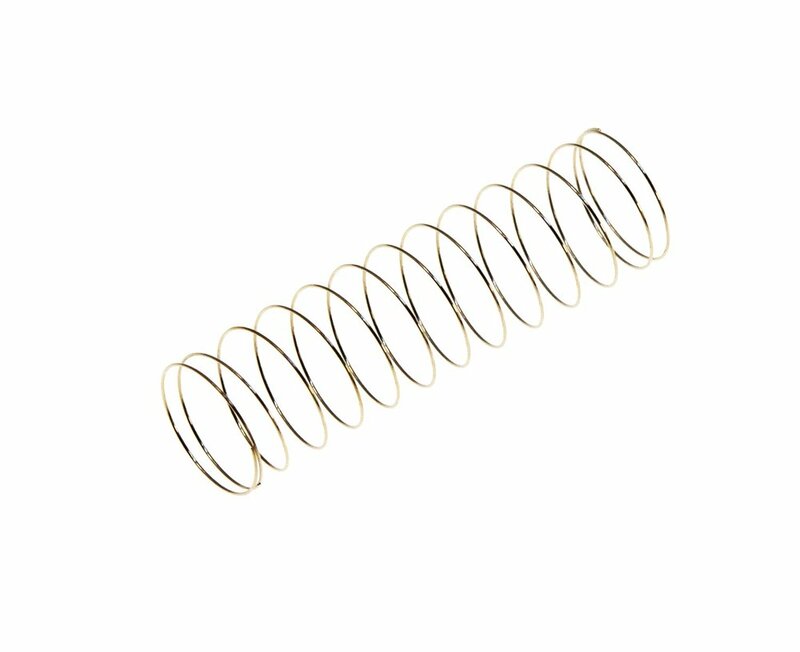 The resulting torque from the mainspring is equivalent to 5kg. The automaton’s mechanism is based on a system requiring three cams, found around the circumference of the barrel; one to direct the bird’s rotation, a second to control the opening and closing of the beak, the flapping of the wings, and the movement of the tail; and a third that adjusts the tone of the whistle. Above are two additional discs which act as spacers between the cams. Rect-verso of the assembled barrel showing the 3 cams (with 2 spacers) in place. The automaton train wheels which transmit the power between the barrel and the cam shaft. The steel plugs with the 'V' slots hold in place the bars upon which the assembled cam-shaft slides. The mainplate and upper train bridge. A selection of levers, racks and springs, all made in hardened steel, decorated and assembled by hand. The central rack drives the rotational movement of the bird, leaning directly against one of the cams turning on the barrel. The pillar wheel, (unseen after assembly) which acts as the selection device for the on/off of the animation and song. The winding mechanism for the automaton. 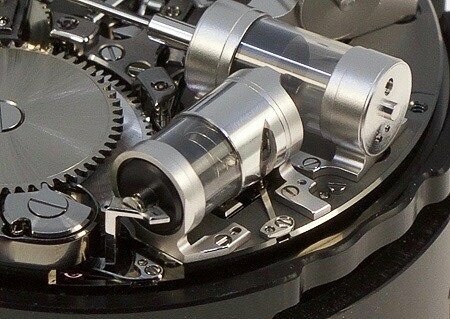 The movement is held in a titanium movement ring which has a black PVD coating. 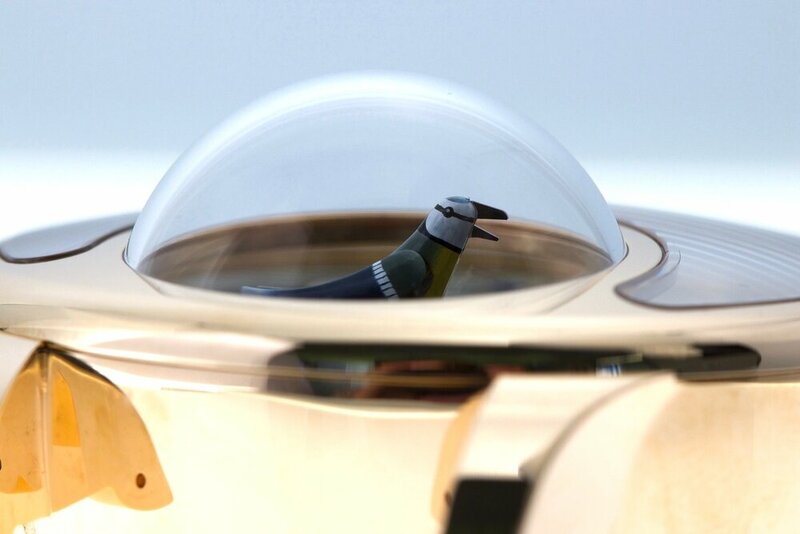 The titanium material reduces the sound absorbed by the case when the bird sings. 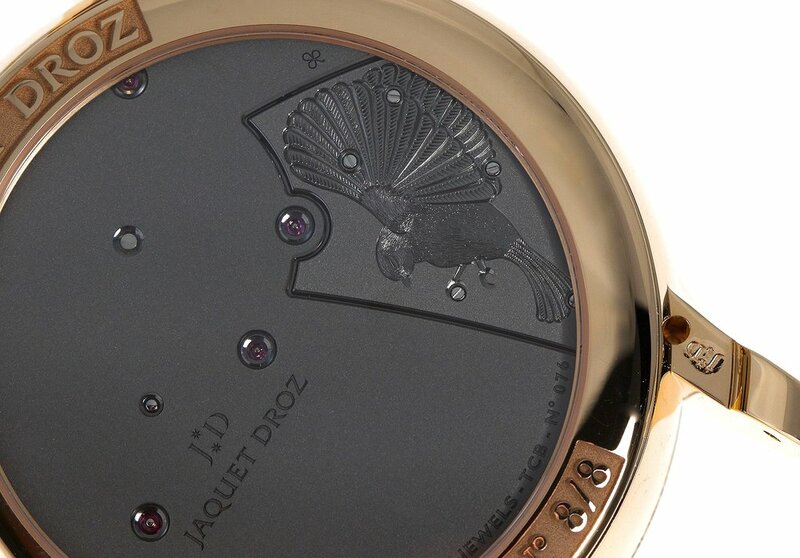 Jaquet Droz 6150, self-winding mechanical movement, silicon balance spring and pallet horns. 21,600 v.p.h. Power reserve 38 hours. 29 Jewels. An example of how the individual components (here a mainplate) are stored and transported after they are finished and before assembly. A non-exhaustive collection of the specialised watchmakers tools required to assemble and adjust the mechanism. The miniaturisation of complications from horology and the world of automatons is the most challenging transition a mechanism can make. Whether a grand-sonnerie, toubillon or jacquemart, all of these mechanisms, born in the past carry the romance of tradition and history. Translating these mechanisms into wrist carried machines which endure the daily shocks of life is no small achievement. The final product requires consideration that goes beyond that of its ancestor's expectations. As such the results push forward both the innovative execution of the ideas, as well as watchmaking as a cultural statement that defines mechanical art. To download a high-resolution book format of this deconstruction please click here.